Replacing a bestseller with a bestseller is usually something of a challenge, but with the second generation Focus, Ford makes the task look simple. Don't be deceived though - the 2005 Focus is completely different to the first-generation model, even though it shares many of that model's virtues. Foremost among the Focus's traditional appeal has been its driveability. The latest model to carry the badge improves on the already class-leading dynamics of the last model to give levels of driver feedback and involvement that many more expensive cars fail to match. It does so as a matter of necessity, because class rivals such as the Vauxhall Astra and Volkswagen Golf have also upped their game to a considerable degree. It is evident that a great deal of attention has been paid to the Focus's interior quality too, which is even further ahead of its predecessor. Soft-touch plastics and two-tone colour schemes are deployed to great effect, moving the Focus a notch closer to premium rivals like the Audi A3. So subtle is Ford's approach that on first acquaintance, the car can seem a little disappointing. The styling isn't exactly radical, the range of powerplants contains many familiar units and the Focus' popularity among fleet buyers ensures that owning one will never merit you a second glance. Stick with it though, and the Focus really starts to impress. It doesn't do much that is new, but what it does do, it does better than ever before. In important areas such as steering, ride and comfort, Ford has hit the bullseye. For a general purpose vehicle supposed to major on utility, it offers a very enjoyable drive that can be relaxing or involving according to the pilot's mood. Proving that evolution works just as well as a series of small but significant improvements as it does operating in sudden, dramatic revisions, the Focus is an extremely satisfying car that should provide an excellent ownership experience. Purchase costs are very keen, and mean no buyer of a C-segment car can afford to ignore the Focus as a potential purchase. With so many vehicles destined to find their way onto business fleets, reliability should be a given and whenever remedial work is required, it should not be expensive. Likewise spare parts. Diesel powerplants – particularly the impressive 1.6 Duratorq - are of obvious appeal to the economically-minded. Rear seat passengers don't fare quite as well as they do in some rivals, but there is still enough space for short to medium distance journeys. Taller passengers might find the fall of the roofline to be too close for comfort though. The Focus may not boast the largest number of cubbyholes and storage areas in its class, but those that do exist are actually useful. The boot is a good size, aided by a very wide tailgate. A few minor but welcome improvements have been made, including a better position for the gearstick and increased movement for the steering wheel. Dials look very appealing, switches are made from warm-feeling plastic. Only the brick-like column-mounted volume control for the audio system spoils things. Perhaps significantly, it was carried over from the last Focus and looks completely out of place. It is also too easy to operate unintentionally. As much thought and effort has gone into the Focus's interior as any other aspect of the car's development, tackling an area in which the old Focus was vulnerable to criticism. New two-tone interior colour schemes are particularly fetching. An area that is often overlooked is interior illumination. Ford's specialist department in this area is hugely enthusiastic and effective. They've repeated the impressive tricks used on the C-MAX so that night driving is soothing and enhances the Focus's premium feel. Provided gratis is remote central locking (including the fuel flap), an immobiliser and a visible VIN number. Keyless entry and ignition can be selected from the options list, as can an upgraded alarm system. All models have dual-stage front airbags, and side airbags. LX models and above also have side curtain airbags. Optional adjustable pedals that detach themselves in the event of a crash are on the list, too. Much of the safety package, including the design of crumple zones and head restraints, was handled by Ford's experts at Volvo, which inspires confidence. The greatest danger when introducing the newest Focus was that the old car's reputation for being a driver's car would be diluted. If anything it has been enhanced in the new Focus. It is very enjoyable to drive and the chassis never feels like it is being pushed remotely close to its limits – which certainly bodes well for performance variants. Its greatest asset is superbly precise steering that gives just the right amount of assistance, whatever the shape of the corner to be negotiated. 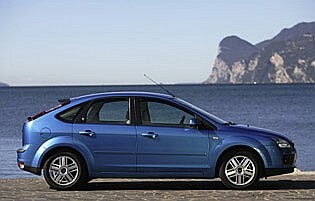 The Focus suffers slightly as a family vehicle, if only because its C-MAX sibling is the obvious choice. Nevertheless, it's spacious enough to perform on the school run or for giving lifts to friends. It could work as a family car quite well for city-centre dwellers with limited space for parking. 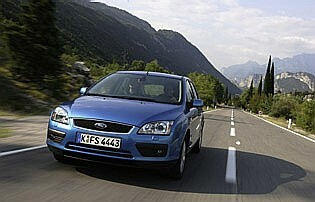 Unless it comes as part of an employment package, a Focus is unlikely to feature as a first car. The old model might soon be adopted by used buyers as a good starting point, but in general a Ford Ka or Fiesta would make a more sensible proposition. Though it will inevitably be as ubiquitous as ever on our streets, the Focus has taken a definite step up the image ladder. After all, strip away the dressing and underneath the car shares a large part of its DNA with Volvo's extremely classy S40 (and Mazda's well-regarded 3). 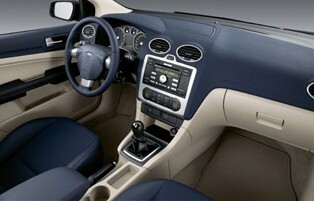 Some of the interior plastics and tactile surfaces are reminiscent of another Ford company, Jaguar. Despite being a common sight, this does not feel like a common car. Buyers should consider whether the three or five-door model better suits their needs. Anyone with more specific accessibility issues to take into account might find the taller C-MAX people carrier a better bet, as the seats in the Focus are fairly low-slung. Studio models miss out on a CD player and only have two speakers, which seems rather stingy. Other models get a six-speaker CD system apart from the technology-oriented Titanium with its impressive eight speaker Sony system. Buyers with more cash can indulge in plenty of infotainment upgrades in front and rear seats with Bluetooth technology, voice controls, DVD players and the like. A shake-up of the badging system divides the Focus into comfort and sport-oriented branches, which can get a little confusing. The line-up comprises entry-level Studio, LX, Sport, Zetec, Ghia and Titanium models. 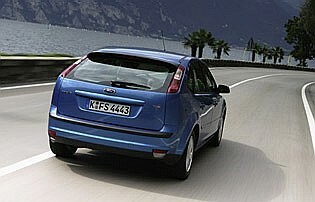 External colour schemes are practically limitless, though somehow the Focus looks best when in traditional Ford blue. Air conditioning is standard in all but entry-level models. Despite the slightly different roofline, three and five-door models are equally easy to park. Visibility is fairly good, though the thickish rear pillars mean plenty of mirror-watching is required if sensors (optional extras on all models) aren't fitted. A steel space saver is standard, although a full-size steel spare is a cost option. As Ford's core car for the UK market, the company has provided a comprehensive choice of engines to suit every taste and requirement. Initially there are 1.4 (80PS), 1.6 (100PS) and 2.0-litre (145PS) petrol powerplants while diesel variants include a 1.6 (109PS) and 2.0 (136PS). Other units, including a performance oriented one will follow over the car's lifecycle. Manual, automatic and CVT transmissions are available with various engine combinations. Petrol engine options – 1.6-litre (99bhp and 113bhp); 1.8-litre (123bhp); 2.0-litre (143bhp); 2.5-litre (223bhp and 301). Diesel options – 1.6-litre (90 and 107bhp); 2.0-litre (134bhp) Transmission options: five-speed manual gearbox, six-speed manual gearbox, five-speed automatic gearbox, six-speed automatic twin-clutch automatic with manual over-ride. Trim levels: Studio, Style, Econetic, Zetec, Titanium, ST, RS.